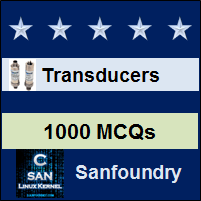 This set of Instrumentation Transducers Multiple Choice Questions & Answers (MCQs) focuses on ” Resistive Transducers”. Explanation: Resistive transducers may be primary or secondary transducers according to application. 2. What will happen to resistance, if length of conductor is increased? Explanation: As length of conductor increases, resistance increases according to expression R = (ϱl)/A. 3. Which of the following can be measured using change in resistivity? Explanation: Change in resistivity can be brought in measurement of all the mentioned quantities, as resistivity is sensitive to temperature. 4. What will happen for resistivity metal and semiconductor if temperature is increased? Explanation: Metal has a positive temperature coefficient of resistance and semiconductor has a negative temperature coefficient of resistance. 5. What is the relation of temperature coefficient of resistivity on coefficient of thermal expansion in RTD? Explanation: It is used to provide a considerable change in resistance when exposed to temperature. 6. A metal with temperature coefficient of resistance has a value 200, its initial resistance is given by 40Ω. For an increase in 300c to350c what will be the final resistance value? Explanation: Answer obtained using expression RT=R0(1+αΔT), where α represents temperature coefficient of resistance, R0 and RT represents initial and final resistance values. 7. Which of the following can be used to measure using thermistors? Explanation: Thermistor at 200c can be used to measure resistance values in between 100Ω and 1MΩ. 8. Thermistors may be in wire form. Explanation: Due to high brittleness thermistors cannot be form into wire type. Hence they are shaped into bead form. 9. Which of the following is correct for thermistors? Explanation: For thermistors as temperature increase, resistance decreases. 10. Thermistors have high stability. Explanation: Stability of thermistors are not satisfactory. They can be improved by using high temperature.